The media does not like people spending money to elect non-Democrats. That is the only conclusion I can draw from the fact that all of their articles on "dark money" seem to focus almost exclusively on the Koch brothers (who to my eye are more libertarian than Republican). 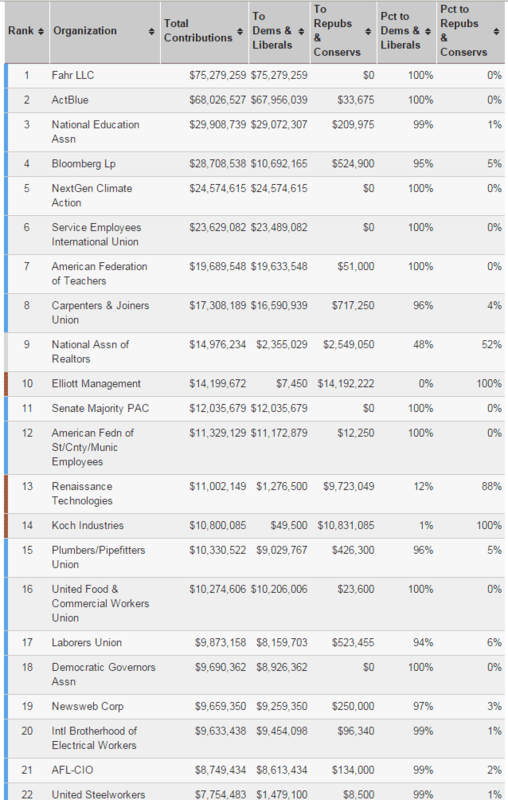 One would get the impression that the Koch's are the #1 giver of money to election campaigns, but in fact according to OpenSecrets.org they were #14 in 2014 and #49 in all elections since 2002. Why wouldn't the media illustrate election-spending articles with someone in the top 10? It's as if the sports media spent all its time talking exclusively about quarterback Ryan Tannehill (14th in 2015 in NFL passing yards per game) without ever mentioning Tom Brady or Drew Brees. If the Koch brothers deserve to be excoriated for their election spending, then the organizations that give more than they must really be evil, right? If one were cynical, one might think that the media ignores the top 8 or 10 because they mostly all give to Democrats. Well, here is the list from 2014 via OpenSecrets.org. Consider this: in 2013, the left wing Center for Public Integrity reported that âFour foundations run by [the Koch brothers] hold a combined $310 million in assetsâ¦â By contrast, the Ford Foundationâs endowment is more than $12 billion â about 38x larger than the Koch Foundations. On a list of the top 100 US Foundations (by asset size), the Ford Foundation is #2. The various Koch Foundations donât make the list, nor do they make the list of top 100 Foundations by annual giving. Yet, the news media and transparency groups constantly harp on the Kochâs massive organization and its âinsidious,â âdark moneyâ influence on American politics, while almost completely ignoring the far larger left-wing political Foundations. Postscript: If you really want dark, check out the website for hedge fund Elliott Management. There is not a single byte of information in the publicly accessible pages, only links to contact forms. I almost hate beating on the silly folks who run the City of Glendale even further, but they keep screwing up. One of the reasons I think that city officials like those in Glendale like to dabble in real estate and sports stadiums is what I call the "bigshot effect." They don't have any capital of their own, and they don't have the skills such that anyone else would (voluntarily) trust them to invest other people's money, but with a poll of tax money they get to play Donald Trump and act like they are big wheels. The Glendale city council did this for years, and when their incompetence inevitably led to things starting to fall apart, they have simply thrown more money at it to try to protect their personal prestige. But unfortunately, incompetence generally is an infinite reservoir, and apparently the City has screwed up again. Years ago, when the City promised the rich people who owned the AZ Cardinals a new half billion dollar stadium, they put a contract to that effect on paper. Granted, this was a sorry giveaway, spending hundreds of millions of dollars for a stadium that would be used by the Cardinals for 30 hours a year, by the Fiesta Bowl for 3 hours a year, and by the NFL for a Superbowl for 3 hours every 6-7 years. But, never-the-less, the City made a contractual agreement. And then, in its rush to be real estate bigshots, the city turned about 3700 parking spaces promised contractually to the Cardinals over to a developer to create an outlet mall (of the sort that has been quietly going bankrupt all over the country over the last few years). Incredibly, the city did this without any plan for how to replace the parking it owed the Cardinals. To this day, it has no plan. Apparently, there were also some shenanigans with $25 million that had been escrowed to build a parking garage. The demand letter also blames the parking problem on the city's dealings with Steve Ellman, Westgate's former developer and a one-time co-owner of the Phoenix Coyotes. The letter states that Ellman's relationship with the city has been "characterized by a lack of transparency." The letter raises questions about a January 2011 arrangement in which the city and Ellman equally split a $25million escrow fund that had been earmarked to build a parking garage in Westgate, the team said. Ellman put that money in escrow in 2008 after failing to keep a promise to the city to provide a set amount of permanent parking in Westgate. By early 2011, half of that money went back to Ellman's lenders as part of a deal to try to keep the Coyotes in Glendale, while the city received the other $12.5 million in the account. What a mess. This is what happens when politicians try to be bigshots with our money.